For a second, I thought he meant Elise. Then a beautiful woman with wide, intelligent eyes hurried across the auditorium after Narcissus, dodging tables and lingering models with a nymph like grace. “E” whipped out a tablet and held a pen at the ready. Was I? I raised an eyebrow and looked to Adonis. “Can we talk about this later?” Adonis asked in an undertone. “Um…” My kind, huh? Modeling wasn’t an uncommon cover career for a god struggling to find worship. We needed the exposure, and we couldn’t lie, which made pursuing acting or most other careers that threw you into the limelight difficult. But I had charm. I could get all the worship I needed by walking through a crowded room. “Draw up the paperwork?” She at least noticed I hadn’t agreed. Her eyes darted up from her tablet every so often as if she were trying not to look occupied by something on her screen. Was she playing a game? Why bother hiding it? Throughout this entire conversation Narcissus hadn’t so much as looked at her. Narcissus was an exceptionally good-looking demigod, the son of a river god and a nymph, and his pride and arrogance attracted the attention of the goddess Nemesis. She lured him to a pond where he could see his own reflection, and the arrogant fool fell in love with it. Narcissus wouldn’t eat, wouldn’t drink, wouldn’t leave because he was so enraptured with his reflection (most sources do agree he wasn’t aware it was a reflection, he just figured it was another person staring back at him), so he died. Which I have to say does show commitment. Think about it, as he wasted away, his reflection surely got less pretty, so maybe it wasn’t all about looks? 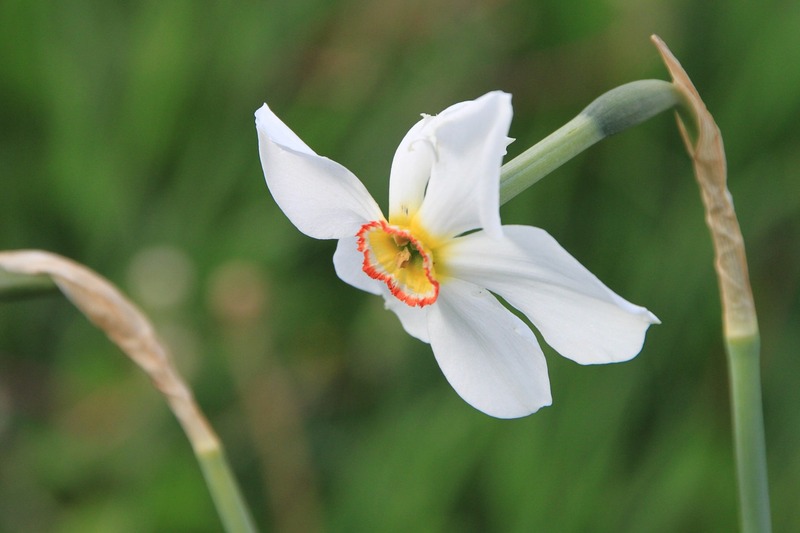 He was turned into the Narcissus plant, which looks like a small white daffodil. They lean over water in such a way that it looks like they are looking at their reflection. However, in some versions of the myth, Nemesis didn’t just randomly lure him to the reflection, but was in fact punishing him for his rejection of the nymph Echo. Echo was a chatty nymph that managed to piss off Hera enough that she was cursed to only repeat what was said to her. How did she piss her off? She either slept with Zeus or distracted Hera while Zeus slept around. At first, I figured this was Hera being Hera and taking out her anger at Zeus on other people. Rewinding for a second to point out that rather than walk up to a hunter, she chose to stalk him through the woods. Granted, that behavior is typical in nymphs, but still. Ecstatic with joy, Echo replied “Let us meet!” and showed herself. Unfortunately, Narcissus was unimpressed with the, by all accounts, beautiful nymph. Perhaps it was because she was so terrible at reading body language, because she tried to embrace Narcissus so much he ran away. I’m not exactly sure *how* she embraced him, or how clear Narcissus made it that he wasn’t interested, but the demigod felt upset enough by Echo’s attack to yell “May I die before what’s mine is yours.” And really, that seems a bit harsh coming from someone who was fine meeting and chatting two seconds ago. “What’s mine is yours,” Echo sadly replied, still not taking the hint. Echo stalked Narcissus and repeated any words of love he said to another (including his reflection) until all that was left of her was her voice. Let’s unpack that a bit. Narcissus was open to meeting, but did not return her affection. Her response was to stalk him and take comfort in kind things he said to other people by pretending they were about her. That’s…I mean that’s the modern day equivalent of cutting your crush’s girlfriend’s head out of pictures with the two of them and pasting in your own. Add the self harm into that (she literally wasted away into nothingness) and you’ve got a bit of a nightmarish picture. Her voice survived, and according to Greek mythology she’s still around. Whenever you hear an echo, it’s her. Stalking you. Because she still has no life.